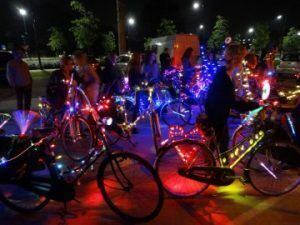 Cyclists are being sought to take part in a colourful night time ride through the streets of Stoke-on-Trent. Appetite is bringing Lullaby, the latest project by acclaimed artist Luke Jerram, to North Staffordshire to coincide with the city’s involvement in the Tour of Britain. The sleek racing bikes of the professional cycling teams will be replaced by brightly lit cycles of every variety for the new public art event by Jerram who, along with Appetite, brought the popular Play Me I’m Yours pianos to the Potteries in 2014. Lullaby is a mass participation event which will see cyclists take to the streets on five nights from Sunday, 6 September accompanied by the gentle refrain of a lullaby. 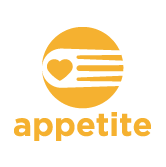 “We need riders of all ages and abilities to take part,” said Gary Cicinskas of Appetite. “All people need to do is bring their bikes to the five venues and they will be provided with a lights pack. Events are being held on successive nights at Bentilee, Meir, Burslem, Stoke and City Centre Hanley. Cyclists should register at 6.30pm each evening for the rides that start at 7.30pm. Full details including venues for registration can be found online here – http://www.appetitestoke.co.uk/blog/2015/08/ride-with-lullaby. Lullaby was inspired by Luke Jerram’s memories of a brightly lit Christmas parade which passed by his childhood home. Rides have been held in the UK and the Netherlands, inspiring up to 80 cyclists each night. Stoke-on-Trent is hosting the start of a stage of the Tour of Britain on Friday, 11 September. Cycling stars from the likes of Team Sky will set off from outside the intu Potteries Shopping Centre at 10.30am. Appetite is the Creative People and Places programme taking place in Stoke-on-Trent from 2013 to 2016. Appetite aims to get more people in Stoke-on-Trent to experience and be inspired by the arts. This investment in the arts and cultural sector of the area aims to mobilise and strengthen the skills, knowledge and infrastructure that already exists within the area and provide unprecedented opportunities for more people to see, make and influence more art in the city. The Appetite programme is funded by Arts Council England and is led by the New Vic Theatre in partnership with B Arts, Brighter Futures, Partners in Creative Learning and Staffordshire University. It is supported by Stoke-on-Trent City Council.